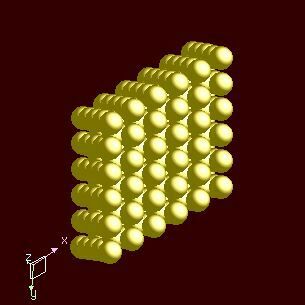 Praseodymium atoms have 59 electrons and the shell structure is 2.8.18.21.8.2. The ground state electronic configuration of neutral praseodymium is [Xe].4f3.6s2 and the term symbol of praseodymium is 4I9/2. Praseodymium: description Your user agent does not support the HTML5 Audio element. Praseodymium is soft, silvery, malleable, and ductile. It was prepared in relatively pure form in 1931. It is somewhat more resistant to corrosion in air than europium, lanthanum, cerium, or neodymium, but it does develop a green oxide coating that "spalls" away when exposed to air. The metal should be stored under an inert atmosphere or under mineral oil or petroleum. The rare-earth oxides, including Pr2O3, are among the most refractory substances known. It is a component of misch metal, used for lighter flints, and of the glass in welders' goggles. The solid state structure of praseodymium is: bcc (body-centred cubic). Praseodymium has no biological role but is said to stimulate the metabolism. Reactions of praseodymium as the element with air, water, halogens, acids, and bases where known. Binary compounds with halogens (known as halides), oxygen (known as oxides), hydrogen (known as hydrides), and other compounds of praseodymium where known. Bond strengths; lattice energies of praseodymium halides, hydrides, oxides (where known); and reduction potentials where known. 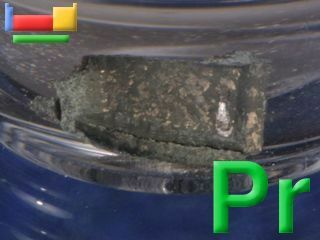 Praseodymium was discovered by Carl F. Auer von Welsbach in 1885 at Austria. Origin of name: from the Greek words "prasios didymos" meaning "green twin". 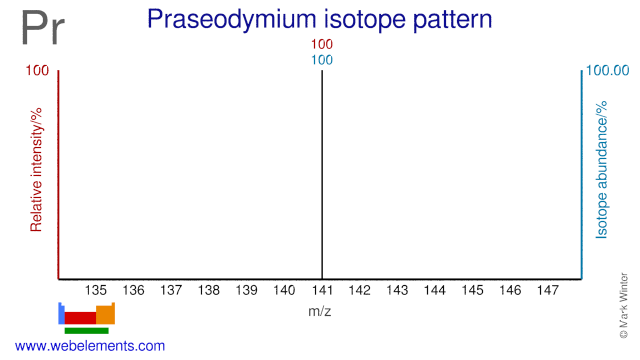 Isotope abundances of praseodymium with the most intense signal set to 100%. Isolation: praseodymium metal is available commercially so it is not normally necessary to make it in the laboratory, which is just as well as it is difficult to isolate as the pure metal. This is largely because of the way it is found in nature. The lanthanoids are found in nature in a number of minerals. The most important are xenotime, monazite, and bastnaesite. The first two are orthophosphate minerals LnPO4 (Ln deonotes a mixture of all the lanthanoids except promethium which is vanishingly rare) and the third is a fluoride carbonate LnCO3F. Lanthanoids with even atomic numbers are more common. The most comon lanthanoids in these minerals are, in order, cerium, lanthanum, neodymium, and praseodymium. Monazite also contains thorium and ytrrium which makes handling difficult since thorium and its decomposition products are radioactive. For many purposes it is not particularly necessary to separate the metals, but if separation into individual metals is required, the process is complex. Initially, the metals are extracted as salts from the ores by extraction with sulphuric acid (H2SO4), hydrochloric acid (HCl), and sodium hydroxide (NaOH). Modern purification techniques for these lanthanoid salt mixtures are ingenious and involve selective complexation techniques, solvent extractions, and ion exchange chromatography. Pure praseodymium is available through the reduction of PrF3 with calcium metal. This would work for the other calcium halides as well but the product CaF2 is easier to handle under the reaction conditions (heat to 50°C above the melting point of the element in an argon atmosphere). Excess calcium is removed from the reaction mixture under vacuum.